See the gem-toned, blue waters of Lake Sarmiento under the shadow the Paine mountain range during this full-day, guided hike that includes gaiters, hiking poles, and lunch. 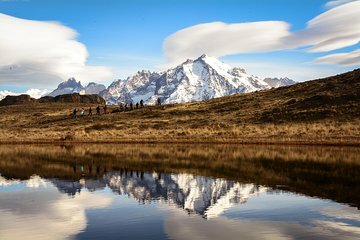 Enter Torres del Paine National Park to hike alongside the lake before visiting some 6,000-year-old cave drawings. Take in wildlife and birds moving in the wide-open space and enjoy your boxed lunch near the glacier-fed Paine Cascade. Front Lights on winter season. This tour does not operate on December 25th and January 1st. We recommend wear comfortable clothing and shoes, sunglasses, solar blocker, gloves and buff.